For the past 2 years, Force India reigned supreme to be best of the rest (4th) in the WCC. This year the picture isn't rosy for them as Renault & McLaren have made vast improvements & Haas has been surprisingly quick. The midfield battle is so tightly contested that all teams to the last one have scored points. Added Sauber as they seem to be getting stronger after each race. After Abu Dhabi which team would be the proud one to claim best of the rest? It surely will be interesting to keep a close eye on the many battles of the midfield as every track would see a different midfield team being strong. Last edited by UnlikeUday on Mon Oct 08, 2018 11:16 am, edited 3 times in total. Post subject: Re: Battle for being 'Best of the Rest'! For the past 2 years, Force India reigned supreme to be best of the rest (4th) in the WCC. This year the picture isn't rosy for them as Renault & McLaren have made vast improvements & Haas has been surprisingly quick. The midfield battle is so tightly contested that all teams to the last one have scored points. Not included Sauber & Williams in the poll as I don't see them being in the upper midfield bunch. Haas have the 4th best car but Renault will finish 4th in the WDC. STR should probably be up there as well but don't have the drivers to capatilise. We saw what the STR could do in Bahrain where Gasly is a specialist. Alonso may just scrape 7th in the WDC. It will probably be between him and Hulk. I think FI's car is bring flattered by the drivers somewhat. Both Perez and Ocon are in the F1 drivers nightmare of a slower than expected car and an underrated or unproven team mate. Williams would probably be in that midfield with better drivers. McLaren will become..... 4th IMO.... Alonso has been consistent all season except for Monaco... His team mate will pick up the pace as well and score valuable points. Renault/Force India.....5th/6th....Cannot split these teams up, both are very close. Both teams have great drivers . Last Williams Too much friction inside the team. Inexperienced drivers. Alonso was consistent in Monaco too, it's just his engine that wasn't. He was on course to finish about 7th, which is quite consistent with his season to date. I'd say Haas has the 4th best car, but they're being let down by at least one of their drivers. Renault probably has the 5th best car, and two drivers who can score: McLaren has a very close car to Renault, and potentially the better drivers. I'm going to give McLaren the edge. Renault does not have the best driver or P/U or chasis, but they have the best pair of drivers of the teams listed. Alonso is the best driver among the lot but Vandoorne cant provide support. I would agree with those who said that Haas has the best of the rest car. Clearly the Renault P/U is not up to even the customer Ferrari and Mercedes power units. Both McLaren and Haas have very good chassis packages, but it is hard to tell if they are really that much superior to Renault, Force India, or Torro Rosso. In the end I give the nod to Renault because of Hulkenberg and Sainz Jr. I think that given Mclaren case, they are focusing on getting among the top 3. Really, I don't know if they will succeed. What I do know is that you have to be a bit radical to get among them. If that will work, great. If not, they might just finish lower than than 4. I think it's a case of taking a risky approach. They would definitelly finish 4th if this would be their focus. I don't think this is the case at the moment. McLaren because of Alonso IMO, they need some success the sooner the better. Even though McLaren & Renault look strong & have a bigger budget, I'm sure Force India would give them a good fight for 4th. Eihter in Canada or max by France, they'll be upgrading to the new front wing which should bring a good amount of front downforce to their car. I think FI is out of their depth this year against a rejuvenated Renault/McLaren - except for the power tracks (Monza/Spa/Canada and maybe Silverstone), I don't see them being able to beat any of these other two teams on performance alone. The lucky Baku podium is the sole reason they're even in this conversation - they've performed worse than Toro Rosso overall IMO, in spite of having much better drivers. I voted for Renault as their driver *pairing* is the strongest (I don't think Hulkenberg is far behind Alonso, but both him and Sainz are evidently streets ahead of Vandoorne). EDIT: Haas has the strongest car currently, but I doubt they'll finish higher than 6th (likely 7th) because (a) they will be out-developed through the course of the season, and (b) their drivers are Grosjean and Magnussen. Renault, because McLaren isn't capable enough. I most seriously doubt the McLaren/Alonso reasoning for 4th place. It's more between Renault and FI. I voted Renault, but FI, if they drivers keep it clean, will become 4th. yeah, nothing's a dead cert, that's for sure. But if you look at it, FI haven't exactly set the world alight so far, either. They've had a single fortuitous podium which has accounted for more than half their points tally, and they are still well behind McLaren, let alone Renault, so I think they're more likely to be battling TR for 6th than troubling the Renault teams. But I can see an argument for Renault being favourite, absolutely. I also think McLaren are most likely to improve from now on (which they will need to do). Alonso is a big factor because he has kept them in touch more or less on his own so far, despite (imo) them having a car that has mostly been some way off best of the rest at most tracks. Excepting things beyond his control he seems to be able to consistently wring the maximum amount of points from a race, while others in this battle seem to very much run hot and cold. That is a powerful asset when the difference between 5-6th and 11-12th is so small. Hulkenberg and Sainz Jr. will score more points than Alonso by himself. Stoffel Vandoorne doesn't add enough value to make up the difference. Yeah I think Renault will get it. Mclaren has only Alonso while Renault has Hulk and Sainz. These 2 cars are close enough at the moment and I don't think Mclaren will improve enough over the year to distance themselves from the midfield. Force India's car is just not good enough this year. TR's car is lacking and they have driver issues too. Haas are getting thrashed in the development race and I don't trust the 2 knuckle heads they have at the helm. If Grosjean didn't have the awful fortune, Haas would run away with it. McLaren is trash getting bailed out by an all-time great driving talent. As of now Renault has the upper hand when it comes to consistency. This is what earned Force India 'Best of the Rest' for 2 years in a row. Haas seem to have a car better than Renault but Grosjean's untidy driving is hurting their constructor points. Toro Rosso have slipped back in performance. Sauber is getting stronger but just like Toro Rosso, they have only one efficiently able driver to score points. The gaps are very narrow in WCC standings. Few good results by one team and order might competently change. I still voted for Renault but their advantage means little at this point. The Merc engine has been pretty much caught up now so Force India won't get 4th. They are much more consistent than the others and seem to be on a gradual upward curve. Haas are inconsistent mainly due to their drivers. Magnussen is outperforming Grosjean (obviously), but IMO Magnussen isn’t doing a special job either. Force India could be the one to challenge, but they need to find a bit more speed. Haas might have a better car at some races, but the entire operation is not smooth at all. Drivers they have a problem with one. Team work as well how many times have the pit crew let them down, or they turn up to a grandprix and the car is nowhere e.g in Monaco they were at the back and could not explain why! Also when they score, they score big points thats why folks think they are the best of the rest. I think Renault is more consistent. I think people think Haas have the 4th quickest car. Too me that seems fairly obvious. Obviously other things let them down. 4th best car has been changing with tracks and tyres this season, mostly between Haas and Renault. Overall (but not on every track!) Haas has been ahead but I expect them to get outdeveloped by Renault in the second half of the season. I think Magnussen has done really well so far this season, as good as the Renault drivers (who each had their off-weekends as well). Grosjean combined underperformance with bad luck so far. - FI was strong on some tracks but weak on others. They are far behind their last season form but maybe overall still 6th best. - STR was even more fluctuating than the other ones and Hartley is often not up to the job. Plus the Honda is still no asset. - McLaren started maybe 6th best but went downhill since then. Lately they may have been the worst car on the grid in some races. Alonso's fantastic driving is keeping them in the hunt but Vandoorne's performance more realistically reflects where they are. - Williams may be better than they look - if they only had decent drivers. With two copies of Kevin Magnussen, they'd be 4th right now. And Magnussen is almost certainly not as good as Hulk. I think it's pretty clear Haas has the better car, but that doesn't make them the best team necessarily. Take it race by race and you'll soon realise it's not so straightforward. Haas are closing in on Renault which seem to have stalled in progress / development. Force India, who have had 4 double points finishes in the last 5 races are bound to leap McLaren! Interesting that Force India would be 4th with 102 points if they'd not had their points total wiped out mid-season. So they are still best of the rest really, which is quite an achievement given how off the pace they looked at the start of the season. It's quite astonishing to think that they were slower than McLaren at that point when you consider where they both are now. Also why do "old" Force India not still appear in the championship standings with the 59 points they accumulated? I don't recall previous teams to have disappeared mid-season being wiped off the points table. They've been the 6th best over the season. They're points haul is a testament to hiring good drivers. Perez is such a good point scorer. This could be his 4th time in a row winning Formula B.
I would agree with that. The Haas drivers are as clumsy and inconsistent as they were last season, while both Renault drivers have underperformed: Sainz's general pace has been a touch disappointing while Hulkenberg has had a few poor qualifying sessions, threw away a heap of points in Baku, and made a ridiculous error at the start in Spa which effectively cost him two races with the subsequent grid penalty. I am a little bit surprised that Renault is probably not going to get 4th. Their car has regressed as the season has unfolded and their PU development is just not keeping up with the others. And yes, the drivers have been surprisingly lacking. 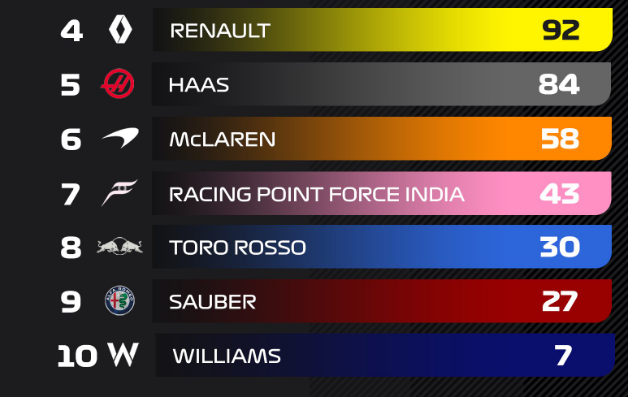 If Force India kept their points from earlier in the season, they would be leading now? It should be Force India. Their development this season - considering that nobody voted for them, and now they have the 4th best car - has been incredible. Renault has really begun to struggle since mid-season, so I expect Haas will overtake them by the season's end. I suspect they switched their focus entirely to 2019 around the time Daniel Ricciardo started showing them interest, which would've been around the period their form began to dip below fourth best. I still think the Haas is the better car and it has been the 4th best car almost throughout the season. FI just have the better drivers through a race. True. Haas, Renault & Toro Rosso handle better than Force India through the most technical sectors. Force India have the best midfield lineup by far - consistent & quick. In other teams, we've noticed often only 1 driver delivers otherwise!